Sasha Kreindlin, CEO of ARShow, hopes augmented reality is the next stage frontier. Will stage-loving audiences buy it? Theater artist Sasha Kreindlin spent about 15 years of his career doing video projections for stage productions, but he always felt like he didn’t get involved in that particular medium early enough. “I was about 10 years too late to the video revolution,” he tells me in a phone interview from Tel Aviv. Theaters have been experimenting with AR for a while now, but the technology usually requires audience members to peer through their smartphones to see the AR elements. ARShow goes a step further, equipping each audience member with an AR headset and integrating the operating system into the theater’s sound system, lighting, and projector. The live actors on stage use monitors to help them seamlessly interact with the show’s AR components. As someone with a theater-arts background, Kreindlin needed help from the tech community to make ARShow a reality. His cofounders include Simon Litsyn, a computer science and electronics professor at Tel Aviv University; Isaac Barel, a digital designer and the company’s CTO; and Elena Litsyn, a theoretical mathematician. Kreindlin, who is CEO, says the company completed a seed round of funding for the operating system and is now seeking to raise $8 million for its own headsets. In the interim, he says he hopes sponsorships from companies like Samsung will provide the hardware. ARShow has bigger ambitions than children’s shows, though. The company says it’s in talks with U.S. theaters and production companies in “major markets,” although it declined to name them. Kreindlin says he’d like to debut the system on a mid-size stage off-Broadway, and would ultimately like to move to a larger Broadway venue. That might prove to be tougher than it sounds. Broadway producers are notoriously risk-averse, and most shows already don’t earn a profit, even without the added production expense of retrofitting a theater with unfamiliar technology. 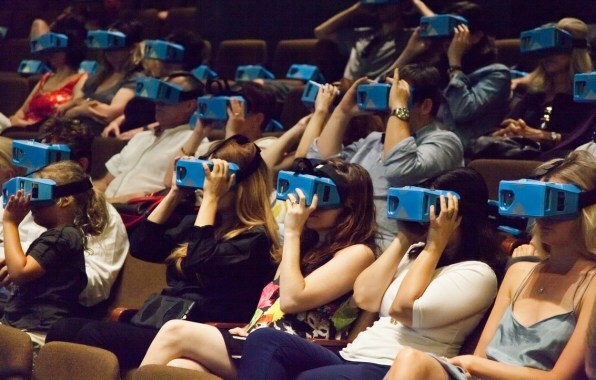 There’s also the question of whether discerning New York theatergoers will see an AR-focused stage show as an affront to the purity of theater—the last refuge for people who want to unplug from technology for a few hours and enjoy a live performance. To that question, Kreindlin cites the early success of Gulliver, which he says is sold out for the next six months. At the same time, he agrees that theaters can be “very conservative” in their approach to new work, and he acknowledges the danger—creatively speaking—of letting special effects upstage the storytelling.